Teddy, owner of Zum Zum restaurant, uses 5 improved cook stoves to feed more than 100 hungry customers daily. 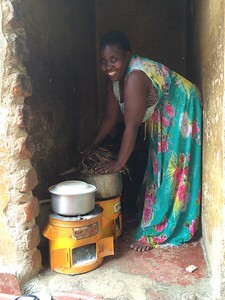 She purchased the stoves in 2014 and reports that they continue to work "perfectly." With her older stoves, 1 sack of charcoal would last approximately 2 weeks. Now the same size sack of charcoal lasts more than 2 months. She is able to reinvest the savings into her business. 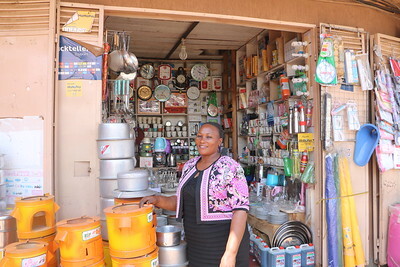 At Butayi Traders, Agnes has been selling improved cook stoves for approximately 14 years. 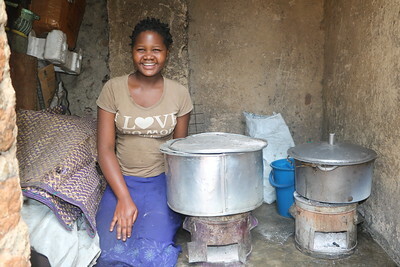 She sells approximately 20 stoves per month, and she finds that her customers appreciate how long the stoves last. 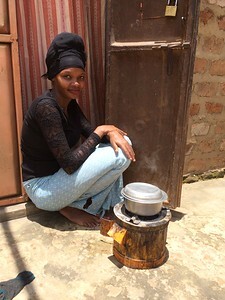 Hadija owns two improved cookstoves, the first of which she purchased in 2015. 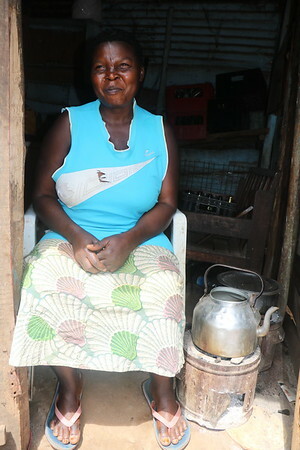 With her old stoves, 1 sack of charcoal purchased at a rate of 90,000 UGX would last only 2 months. 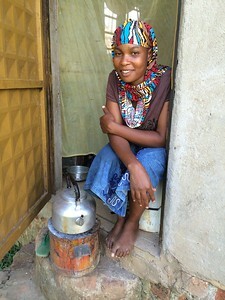 With her improved cook stoves, the same sack lasts for 4 months. She utilizes her cost savings to purchase essentials for her home. 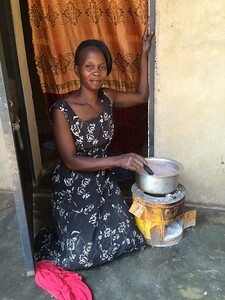 Florence owns two improved cook stoves, which she purchased in 2015 and 2016 respectively. 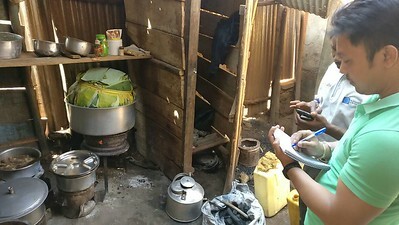 She explained that the cook stoves emit less smoke, retain heart for a long time, and save her approximately 1,000 UGX per day in charcoal costs. She cooks for several people at home and sometimes also prepares meals for the employees at her husband's brick laying business. 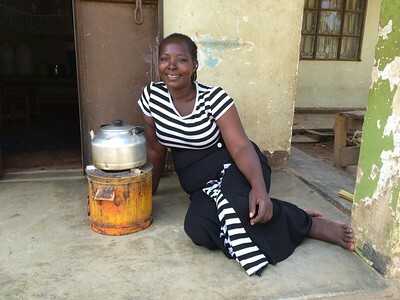 She invests the money she saves with improved cook stoves into a local savings club. 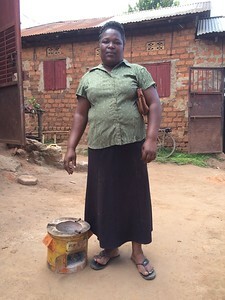 Nampiira purchased her improved cook stove in November 2017. She sometimes cooks for up to 12 people, and she is able to save money each month thanks to the lower charcoal demands of her improved stove. She uses the money she saves to purchase household essentials. 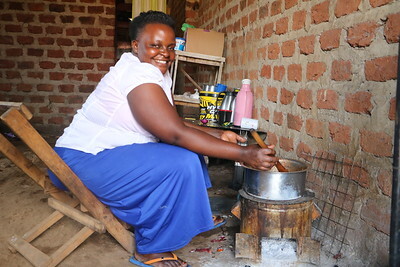 Rehema cooks for a family of 5 people, she currently uses 1,000 UGX (€0.22) a day instead of 2,000 UGX (€0.44) - 3000 UGX (€0.66) she used to spend a day in the past. With these savings, she is able to add some money in her second hand clothes business and buys some essential needs at home. Before buying an improved cook-stove in 2017, Alice used a metallic stove and could use charcoal worthy 2,000 UGX (€0.44) per day. Currently, Alice uses charcoal of 1,000 UGX (€0.22) a day. She realizes a lot of savings and keeps the money saved in a box (piggy bank). When it accumulates, she reinvests it in the charcoal business. 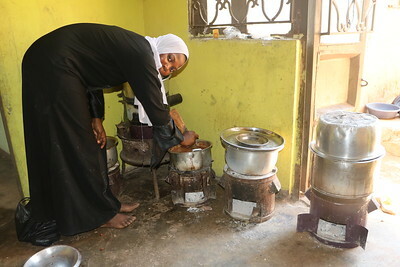 Hanifah bought two improved cook stoves in 2018 after the ones she used for the last several years broke. The improved cook stoves save a lot of charcoal i.e. she uses 1,000 UGX (€0.22) on a day with few people and 3000 UGX (€0.66) on a day when all the eight family members are home instead of the 2,000 UGX (€0.44) and 6000 UGX (€1.56) she used to spend a day (respectively) before she acquired the improved cook stoves. She uses the savings for paying children’s school fees and to invest in her business. Florence uses charcoal of 1,000 UGX (€0.22) for three days to cook food for her three children and husband. Before, she used 1,000 UGX (€0.22) a day to cook for the family. She is able to save 2,000 UGX (€0.44) every three days. She uses the savings to buy essentials for home and nice presents for her children. 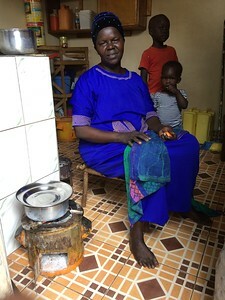 With an improved cook stove, Florence is able to cook inside the house without being afraid of smoke in the house and she is not worried of her children getting burnt by the stove. Hawulah is able to buy her child’s milk which she couldn’t buy before. She is now confident that her child is able to get all food nutrients from the milk and is proud of a healthy baby. This is able through the 1,000 UGX (€0.22) savings she manages to get every day from the charcoal she uses instead of 2,000 UGX (€0.44) she used to spend before. 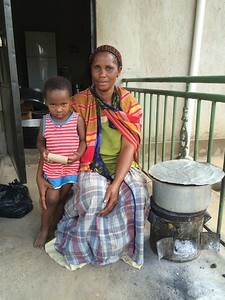 Since the improved cook stove has less smoke, she is comfortable of having her baby around when she cooks inside the house. Lilian uses an improved cook stove to fry cassava and chapatis (pan cakes) for her business and cooks some food for home consumption. On days she does not cook chapatis and cassava, she spends 500 UGX (€0.13) on charcoal a day instead of 1,000 UGX (€0.22) she spent before. 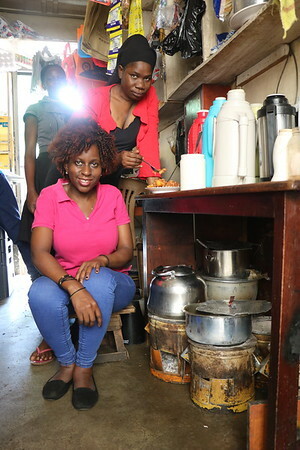 With her business she uses 2,000 UGX (€0.44) a day instead of 4000 UGX (€0.88) before. She serves between 35 - 50 people a day in her business. Lilian saves some of the money in a tin box and adds it in the business when it accumulates. 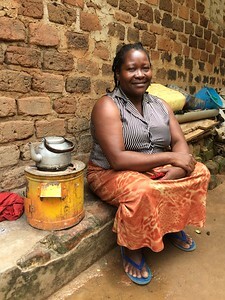 Rose has used the same improved cook stove since 2017. 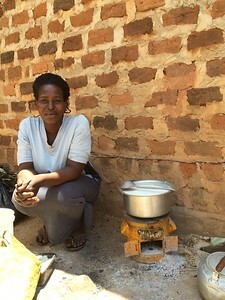 When she started using this stove, her expenses on charcoal reduced to 1,000 UGX (€0.22) a day instead of 2,000 UGX (€0.44) she used to spend before. She is able to save 50% of her previous expenses. With the savings, she is able to buy basic needs for her home. The stove has a ceramic liner which retains heat that enables her to cook and simmer food. The stove does not emit smoke which enables her to cook from inside the house without being affected. She uses this stove to cook for up to eight people. 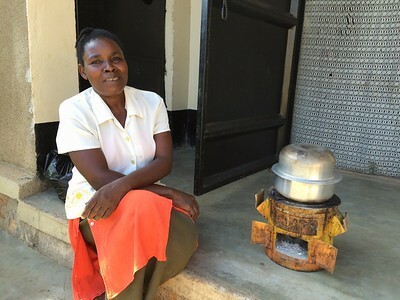 Margaret is a proud owner of two improved cook stoves she obtained in 2017 and March 2018. She uses one sack of charcoal worthy 37,000 UGX (€8.22) for a month. In the past, the same sack used to last two weeks before she acquired improved cook stoves. She is therefore able to save 37,000 UGX (€8.22) every month. Savings are used to cover medical bills and to buy essentials at home. Since she cooks inside the house, she finds the stove friendly because they emit less smoke and they are not hot. 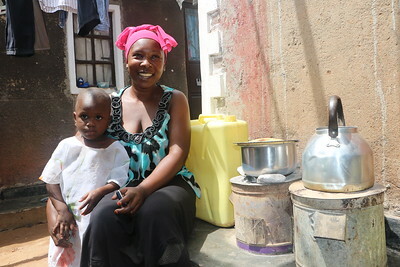 Alice purchased a second improved cook stove in 2014 after realizing the stove she had acquired in 2013 was very efficient, cooked fast, and kept heat for a very long time which enabled her to simmer food on a daily basis. She noticed a very big difference in the consumption of charcoal i.e. 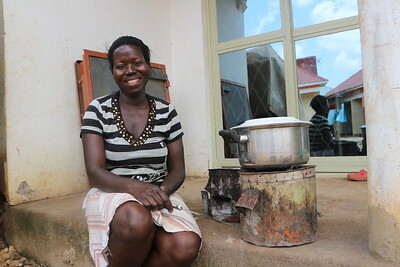 with the improved cook stoves, she spends 1,000 UGX (€0.22) a day to cook food for her family of seven. Before, she used to spend 3000 UGX (€0.66) a day. This means she is able to save 2,000 UGX (€0.44) every day. The savings are collected and are added in her poultry rearing business. She says she advertises the stoves to other people because they are very good and durable. 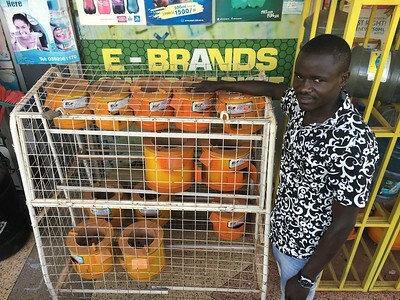 ‘It is unbelievable that I manage to save 2,000 UGX (€0.44) every day on charcoal. In the past, I used charcoal of 4000 UGX (€0.88) every day to cook for seven people in my home’. Audrey uses the savings to pay schools fees for her children. She finds the improved cook stoves to be very efficient and cook fast. She regrets the time she lost without using an improved cook stove. 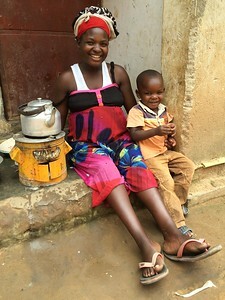 She claims to be an ambassador of the improved cook stoves because she has encouraged several people to acquire them. This is the second improved cook-stove Faith has owned in over 5 years. She acquired it in January 2017. It is strong and durable. Cooks fast and keeps heat for long after cooking. Having spent 2,000 UGX (€0.44) on charcoal every day in the past, she is proud that she spend just 1,000 UGX (€0.22) a day. The savings help her to meet essentials in the home and buying nice stuff for her mum. 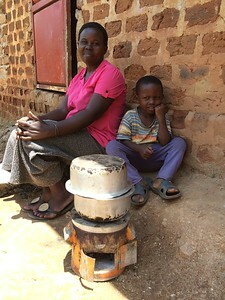 We’ve recently wrapped up monitoring efforts in our Ugandan cookstove project and have submitted our results to Gold Standard for carbon offset issuance. This will be our 10th issuance since our first in 2009. We expect to issue approximately 1 Million Premium Gold Standard Offsets which will be available for purchase shortly. For those of you who have been waiting, we appreciate your patience! Over the years, we’ve been able to help our manufacturing partners increase production and lower cost of improved stoves to end consumers. 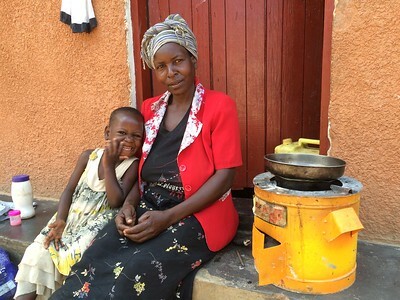 Lately we’ve shifted our efforts to building demand for improved cookstoves, which remains a key challenge in Uganda. 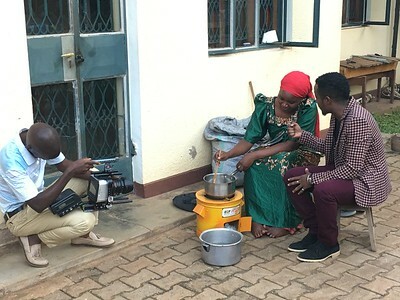 Last year we launched a radio campaign in Uganda to promote our manufacturing partner’s improved stoves and create awareness on the benefits of the technology. You can listen to these radio ads HERE and HERE. This year, we’re doubling down on our mass media efforts by adding a television campaign. Last week we wrapped up filming of two television advertisements that will be aired alongside these radio ads to create even more demand and awareness. Stay tuned, in the next edition of Impact in Focus we’ll be able to share with you the final edits of these TV ads! Rehema is the proud owner of Maama Namu Hardware Store which among other goods, sells improved cookstoves from the project. She makes most stove sales during the festive season and religious celebrations. 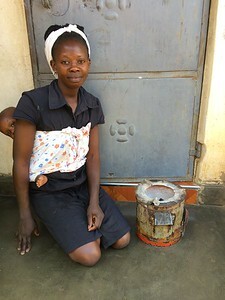 A user of improved cookstoves herself, she sells them with confidence. 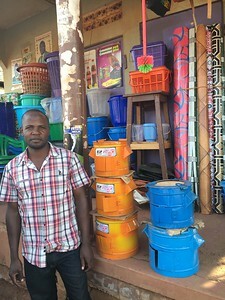 “I've benn selling these cookstoves for over 5 years now and, so far, no customer has ever returned any. Instead, customers come back and refer them to their neighbors - the stoves are exceptional”. 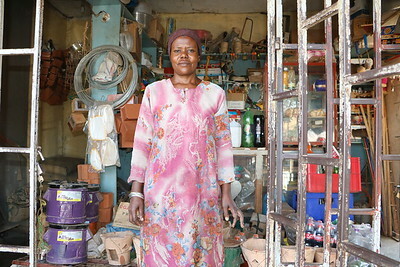 Rehema makes a decent profit from each stove sold and invests the savings in her hardware shop. Faima is a nanny who looks after 3 childrenshe is also responsible for cooking food in the family. She uses stoves that were bought in 2014 and 2016. 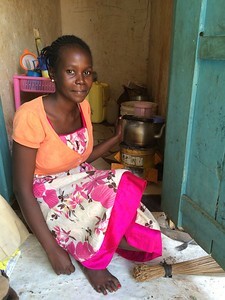 She realizes that these stoves cook really fast compared to the unimproved cookstoves she used at her previous employers home. Thereforeshe is able to cook fast and spares time to interact and give good care to the children. 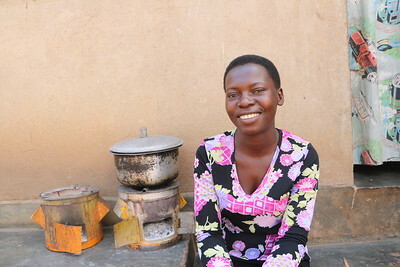 Her employer also tells her that she saves a lot of charcoal due to using improved cookstoves.